RoboCoaster G2, the next generation of roller coaster ride, was demonstrated in Orlando on Friday. The secret of RoboCoaster G2 - it's the only industrial-grade robot available as an amusement park ride, and it now travels on a track that can be made to any configuration. The RoboCoaster G2 has a number of degrees of freedom: the arm has a full range of motion while the seat module at the end of the arm can spin, move side-to-side, or up-and-down. 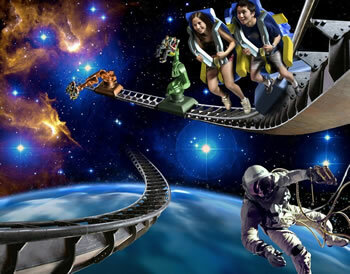 As seen below in this mural, the RoboCoaster G2 can be used to help you experience your favorite science fiction scenario. RoboCoaster G2 can be programmed for specific ride parameters depending on the desires of the passenger - from mild (parents, take note) to extreme (you know who you are). It is a highly flexible system, unlike most roller coaster rides that simply take passengers in identical cars along the same path. 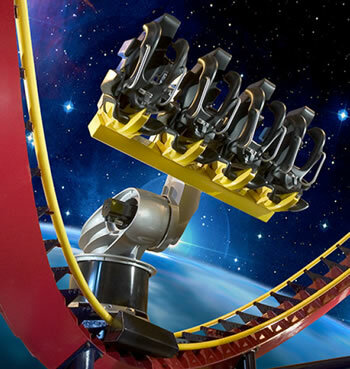 "Riders can be saved by superheroes, soar past galaxies, or experience adventures from around the world on RoboCoaster G2," explains Ron Kelly, President, AMEC's Dynamic Structures business. "The first amusement park to have RoboCoaster will make roller coaster history." I've never quite seen anything like this in science fiction (even though it might help you experience science fiction). But if you like immersive entertainment, sf writers have envisioned these environments for decades. For examples, read about the alien-designed rifle range from Way Station and dimensino from Time is the Simplest Thing, both classic novels from the 1960's by Clifford Simak. RoboCoaster G2 is the result of a collaboration between roller coaster builder AMEC and industrial robot manufacturer KUKA Roboter. AMEC has designed, fabricated and installed such roller coaster rides as Space Mountain and Spiderman at major amusement parks.